Steelsafe Site Ready is the principle temporary edge protection system for structural steel framed structures. It is a systemized guardrail system that is easy to install, using pre-assembled components, designed specifically to the steel section size’s, deck thicknesses and overhang’s. 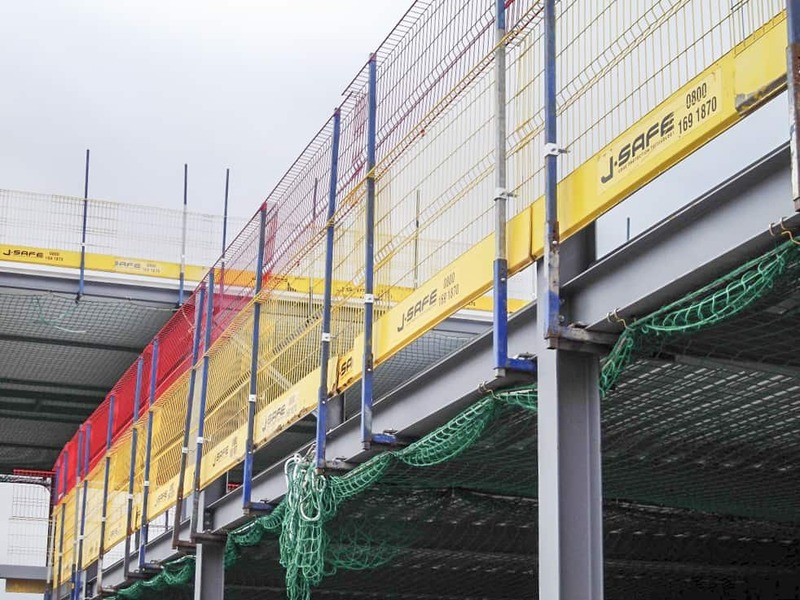 J-SAFE Steelsafe site ready is designed to meet the requirements of EN 13374 Class A which defines a Temporary Edge Protection System as a set of components intended to protect people or objects falling to a lower level. Temporary Edge Protection Systems positioned on the side of the steel beams leave the top and bottom flanges of the sections clear for the installation of steel wall framing systems, protecting the installer until the framing closes the opening. The Site Ready configuration of J-SAFE Steelsafe is a planned system that requires early involvement with the Main contractor and Steel fabricator, and is usually installed onto the steel sections before hoisting into the structure. Hole positions are calculated which are added into the structures model then subsequently drilled during the manufacturing process. These are calculated on individual sections, from stanchion to stanchion so that the section is erected fully protected removing the need to attach loose parts from mewp’s or platforms. 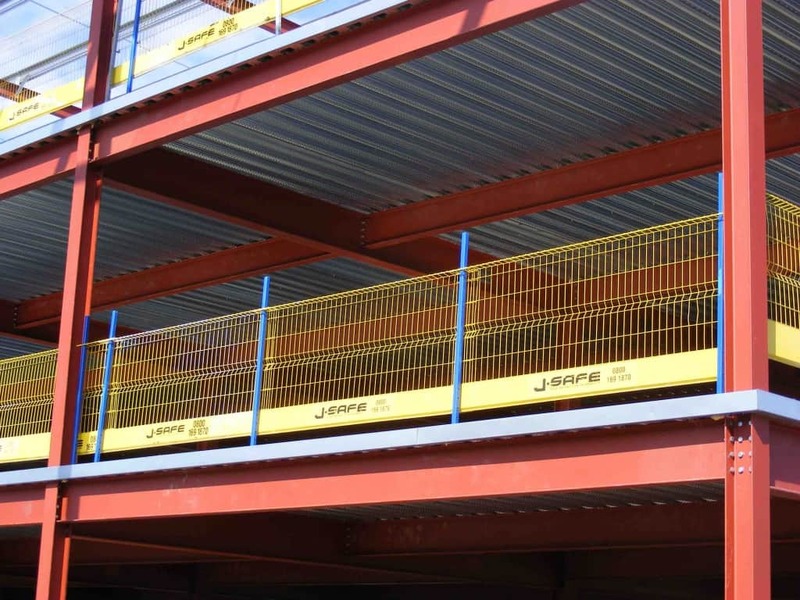 Steelsafe Site Ready is Pre-set to section overhangs and slab dimensions before delivery , so there are only two components to install, Post Assemblies and Barriers that that in one component replace twin guardrails and toe-board without any loose parts. Post assemblies comprise a web Bracket that is bolted through the pre-drilled holes with adjustment from 70mm and 600mm. of work done from height. 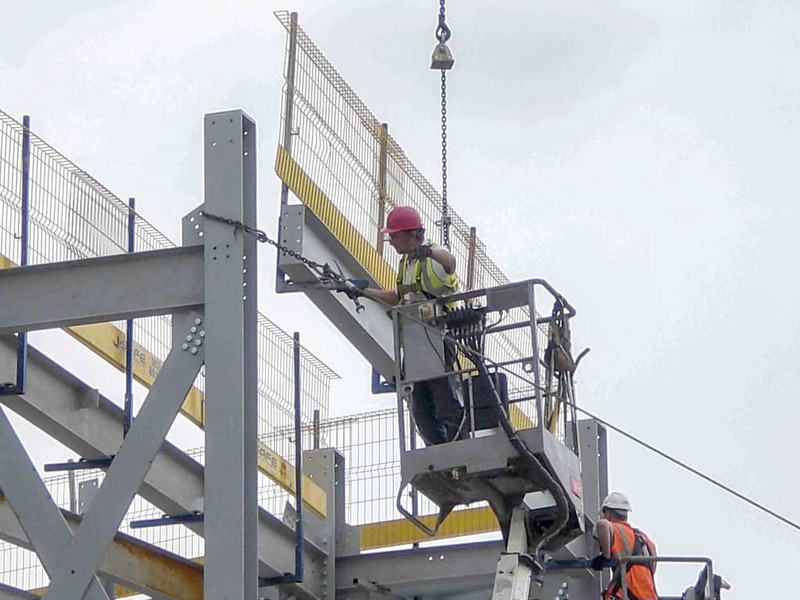 Underslung Clamps provide an economical method of collective fall prevention for operatives working on the steel frame before the structures external walls are in place. Underslung Clamps attach to the bottom flange of sections and are tightened to each side of the central web. (compatible with all common steel section sizes but unsuitable for channels). 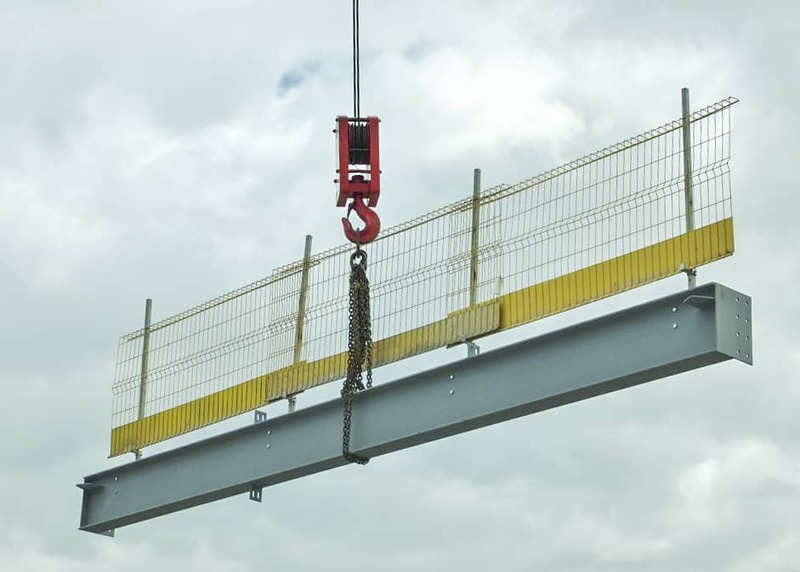 Consisting of only two components , Post Assemblies and Mesh Barriers, Steelsafe Underslung is installed retro-fit onto erected structures from MEWP’s or are installed onto the sections before they are lifted into place. Posts are inserted into the clamps to support Mesh Barriers which slide over the Posts at maximum horizontal spacings of 2400mm. Height adjustment is achieved using the single screw support retaining clip. The Steelsafe Hi-Guard version also available for Mesh barrier height of 1700mm. Technical support including component plotting and site instruction is provided. before the metal deck or pre cast floor is installed. lifting into position to reduce the amount of work done from height. 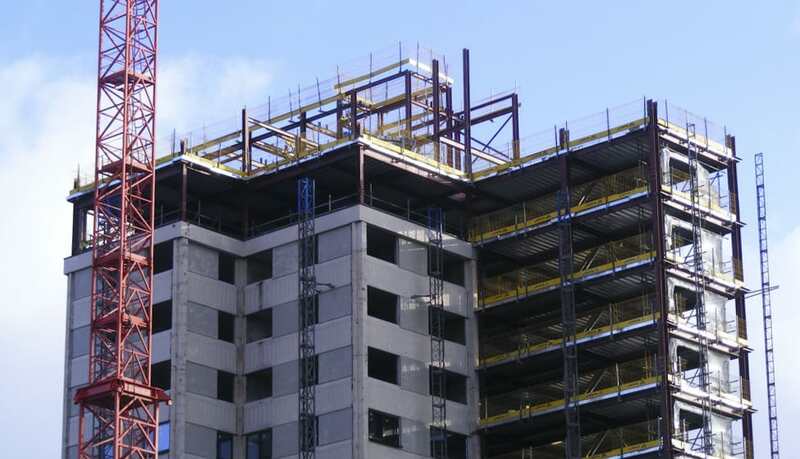 If the steel structure is to be externally clad with facade panels, it is important that the Temporary Edge Protection System is installed centrally on top of the steel sections leaving the perimeter area clear for panel attachment. Sacrificial Sockets made to slab depth length are welded to the top flange of the sections into which are inserted J-SAFE Posts which support mesh barriers. Post spacings are maximum 2400mm, a support hook enables vertical adjustment to accommodate access for metal decking and concrete finishing. Upon completion of the external envelope, the edge protection system is removed and sacrificial sockets are filled with grout. This configuration can be installed on the ground before the steel section of crane-lifted , a detailed design is prepared plotting socket locations during the fabrication phase. This configuration can be installed on the ground before the steel section of crane-lifted , a detailed design is prepared plotting socket locations during the fabrication phase. Installers are provided with detailed layouts and full on-site product training. In some cases it is necessary to provide increased height fall prevention measures, typically when deep floor slabs are to be mounted onto the steel sections, which once in place raise the working level for operatives working on them higher than the guardrail level requirement. Some Principle Contractors insist that the temporary edge protection system employed is capable of preventing falls from operatives working on ladders or podiums and that the standard edge protection height is increased. 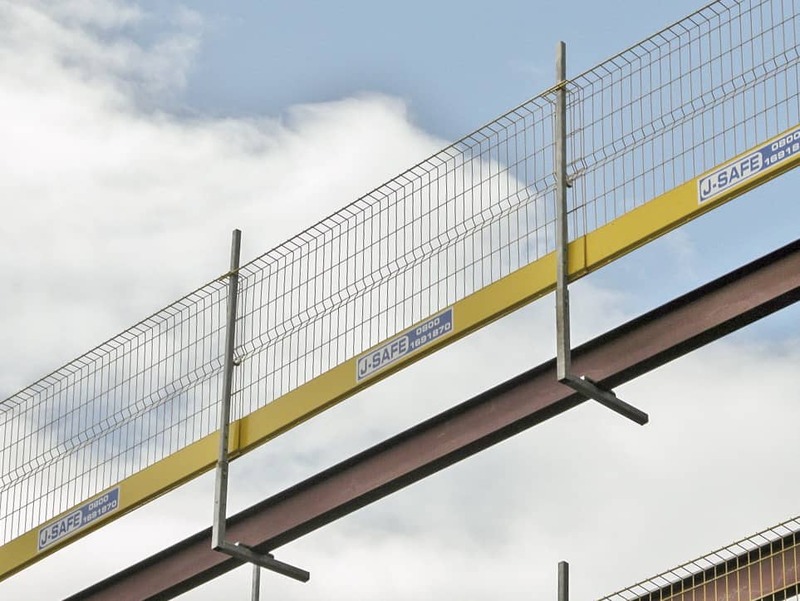 STEELSAFE HI-GUARD provides overall mesh height of 1700mm using a top extension barrier 700mm in height sitting on the J-SAFE standard barrier which is 1140mm in height. STEELSAFE HI-GUARD is compatible with J-SAFE Post Assemblies for attachment to sides of steel sections and Steelsafe Clamps for underslung applications.